It is hard to imagine the lifestyle of the people in prisons unless one gets the opportunity to visit them. Although there is a lot of information about the day-to-day life of incarcerated brothers and sisters, many of its nuances and subtleties can only be experienced firsthand by visiting the prisons themselves. Dharma brother Benny Luhur, one of our sponsors from Indonesia, had asked me since a while ago that he wanted to visit one of the prisons in California with us. 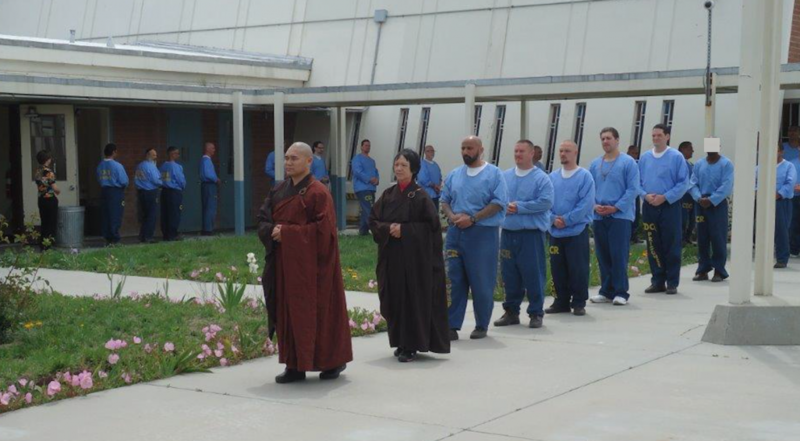 Yesterday, June 14th, 2016 was the day that he had an opportunity to visit the male-only Calipatria State Prison as part of our Buddhist Volunteer Chaplain program. Yesterday services in the prison did not run as smoothly as we had planned, but because of it, Benny got to see all the different situations and difficulties that we face during our regular visit in the prisons. Yesterday, Yard A had service but ran later than scheduled. So Benny used this opportunity to talk to the few brothers who came earlier. Yard B, because of lockdown, couldn’t have service. Therefore we requested to visit the brothers in their cells instead. We got the opportunity to see brothers in the building where they live. One of the brothers, who is the group leader Iron Boddhisatva Buddhist and his sibling recited the hundred-syllable mantra and six-syllable mantra offered to Benny. At Yard C, no one was informed that we were coming. But the clerk was so kind and printed the old ducat list from the computer and called our brothers out for the service. All of a sudden the alarm went off, therefore, no one could come out. One brother in the education building came to the chapel and talked to Benny for almost 30 minutes. Yard D had no service because the clerk deleted the ducat list accidentally from the computer. Overall we spent a total of 6 hours yesterday, shorter than our usual visitation length. We had a wonderful visit, and although not everything went according to what we wished and planned for, we accepted yesterday’s experience as part of life.